Aerial Roots is a new film which was created in conjunction with an exhibition of installations, images, sound and video all by the artist. 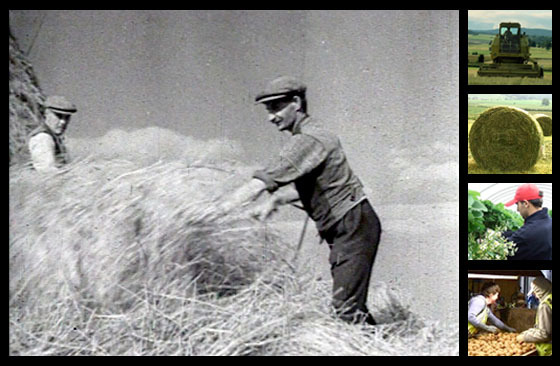 Commissioned by the Scottish Screen Archive Live Award, Su Grierson, artist and member of a Perthshire farming family, combed the film Archive to find footage of traditional farming techniques and responded by creating new video, images and recordings of contemporary farming practice. The main film Aerial Roots is a vibrant visual testament to the persistence of agricultural husbandry and production over an era of technological and scientific changes. This website acts as an archive, with interviews, film clips, images and sounds created during the research and production of the project.